Welcome to this online hobby item store. Buying hobby equipment online, you can get it for a better prize than from your local stores. Often you can also find items or product variants you do not find locally. By clicking on the banners below, you will enter a specialized online store for each cathegory. There you can learn more about or order each product exhibited on this page, and many other products of the same cathegory. Further down at this page you can find explanations about the terms electric. electronic, electronics and electromagnetic. Here are exhibited several kits for building of electronic circuits and devices. 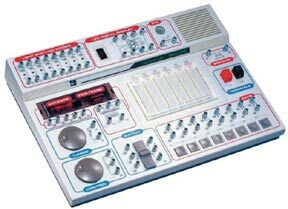 By clicking at the links you can find many more electronic sets for building of specific devices. Learn basic principles of electricity, electronics, physics and magnetism. It includes everything you need to build: Timer buzzer, electronic organ, motion detector, voltage detector, logic tester and many, many moretester and many, many more. Illustrated, lab-style manual included. Requires four "AA" batteries (not included). Mfr. #MX-905. 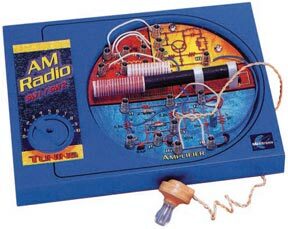 Includes 130 experiments to teach the basic principles of electricity, electronics, physics and magnetism. Comes with built-in speaker, 7-segment LED display, two fully integrated circuits and rotary controls. It includes everything you need to build an AM broadcast station, electronic organ, strobe lights, timer, logic circuits and much more. Easy-to-read, illustrated, lab-style manual included. Requires six "AA" batteries (not included). Mfr. #MX-906. Everything you need to build 300 exciting electronic projects including: a transistor radio, IC organ, Burglar alarm, delayed timer, electronic game, optical volume, multiplier, multiple counter, digital light dimmer tone burst generator, audio signal tracer, electronic candle, voice level, meter metal detector, rain detector, voltage drop alarm, checker, function generator, voltage controlled amplifier, and many many more. Easy to read lab-style manual included. Ages 10 and up. Learn the basics of electronics and put your knowledge to work creating 500 different electronic experiments, special lighting effects, radio transmitter and receivers, amazing electronic sound effects, cool games and more. Includes built-in breadboard for easy wiring and connection of components and an LCD indicates the information during the experiments in process. Build your knowledge by exploring amplifiers, analog and digital circuits plus how to read schematic diagrams. Includes transistors, transformers, diodes, resistors, capacitors, phototransistors, integrated circuits, speaker, earphone, LEDs, LED digit display and a fact-filled, ilustrated, lab-style manual. Requires six "AA" batteries (not inclulustrated, lab-style manual. Requires six "AA" batteries (not included). Mfr. #MX-909. 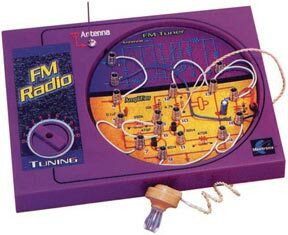 Learn and build your own FM Radio Kit. It's easy, it's fun and it's safe! Tune in your favorite FM radio stations?receives 88-108MHz band. Easy-to-read illustrated operating manual included. Safe, solderless, exciting, educational and fun. Ages 8 and up. Learn and build your own Short Wave Radio Kit. It's easy, it's fun and it's safe! Explore the fascinating world of short wave radio! Receives band from 6-8 MHz (SW1) and 12-18 MHz (SW2). Easy-to-read illustrated operating manual included. Safe, solderless, exciting, educational and fun. Ages 8 and up. 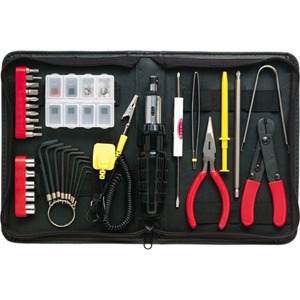 Computer tool kit offers computer repair and IT professionals the necessary tools to handle most repairs and upgrades while on the job. 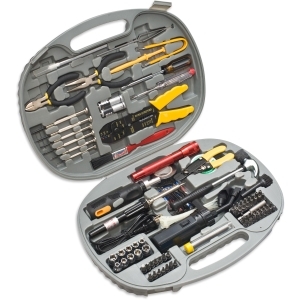 Tools come organized in a durable see through plastic case. Kit contains: Quick heat ceramic soldering iron, 5" side cutter, 5" long nose pliers, 8" crimping tool, 6" adjustable wrench, four Pro-Soft screwdrivers (slotted 3mm and 5mm, Phillips #0 and #1), spring hook, 3 prong holder, utility knife, desoldering pump, alignment tool, ten piece bit set, nine piece socket set, ratchet handle, and carry zipper bag. Kit contains: Full range digital multimeter (similar to #72-6343), plastic parts box, 5" diagonal cutters, 5" long nose pliers, 6" slanted cutters, 6" long nose pliers, 6" stainless steel scissors, 7-in-1 wire cutters/crimpers, three Phillips screwdrivers (#0 x 75, #1 x 75, and #2 x 100mm), three slotted screwdrivers (3 x 75, 5 x 75, and 6 x 100mm), utility knife, stainless steel tweezers, seven piece folding hex wrench, electrical tape, two needle files (round and flat), three soldering aid tools, 30W soldering iron, full size soldering iron stand, solder and desoldering tool in a simi-hard plastic carrying case. Carrying case has two removable pallets, adjustable compartments in bottom and shoulder strap. This is a Electronic Digital Multimeter, one kind of Multifunction Digital Multimeter. The Digital Digital Multimeter is a battery-powered indicating multimeter. The Electronic Digital Multimeter features many test ranges, all symbols show, capacitance, temperature testing, frequency/duty cycle testing, data hold/relative change functions and removable safety leads and jacks. Fluke 179 True RMS digital multimeter with industrial strength test lead probe kit in a compact lightweight soft case.We know industrial electricians work in tough environments, that's why we have kitted our Fluke 179 True RMS digital multimeter with industrial strength test lead probe kit in a compact lightweight soft case. This store has an exceptionally great stock of electronic components and kits for building specific curcuits in addition to all other kind of hobby items. This store has all categories of hobby products for all age levels, but you will find very much suited for children here. Here is a a definition about the therms electric, electronic, electronics and electromagnetic and a list of all the countries in the world. A complete list of all information resourses is given HERE. Many words in the language have a rather fuzzy definition or they are used in one type of circumstance in a way that do not correspond logically to the way the word is used in another circumstance. These facts hold for the words electric, electronic, electronics and electromagnetic. The words have however in common that they are used about devices driven by electricity, and thus electrons in motion and also magnetic fields generated by moving electrons are a common property of these devices. The term "electric" is generally used about all types of devices that furnish electricity to homes and workplaces and that distribute electricity within houses and rooms. The term is also used about devices doing mechanic work, used for heating or used for general lighting. Electric is also used for plants or installations that produce electricity, typically batteries, solar cell panels and power plants. The term "electronic" is used about devices driven by electrcity and that store manipulate and present information of any kind in the form of symbols, sound or pictures. The term is typically used about computers, computing devices, phones, calculators. monitors, loadspeakers, amplifiers, automatation technology and the like and circuits within such devices. A typical property of most electronic devices is the use of semiconductor technology like transistors, diodes and thyristors, even though an electronic device needs not contain such components. The term electronic is often also extended to any type of installation that use semiconductor components, for example installations in power plants that use large semiconductor devices to swich on and off current and lead current in prefered directions. These devices are typically called "power electronics". The term "electronics" is used when one speak about groups of electronic devices without refering to any specific device, when speaking about circuits within an electronic device and when speaking generally about electronic devices. It is also used about the construction and building of electronic devices. the term also means "science of electronic devices". The term "electromagnetic" is used about electric devices where the magnetic field generated by the current is used for mechanical work or for transmission of energy from one place to another. An electric motor is a typical electromagnetic device. A transformer is also such a device, since it uses current in one ciruit to generate periodically changing magnetic fields and that field is used to generate a new current in another circuit with a different volatage. It is easy to find lists of all countries in the word on the Internet. But curiously enough, to find the countries just listed in a simple fasion like the list here, is very difficult. The lists you find nearly allways are integreated in tables, ordered in columns, have hyperlinks, have fancy formatting, etc. Sometimes you just need such an easy list to work out from, for example when you need country names on your web-side. Therefore we present this list as a resource for our visitors. Albania, Algeria, Andorra, Angola, Antigua and Barbuda, Argentina, Armenia,Aruba, Australia, Austria, Azerbaijan, Bahamas, Bahrain, Bangladesh, Barbados, Belarus, Belgium, Belize, Benin, Bermuda, Bhutan, Bolivia,Bosnia and Herzegovina, Botswana, Brazil, Brunei, Bulgaria, Burkina Faso, Burma, Burundi, Buthan Cambodia, Cameroon, Canada, Cape Verde, Cayman Islands,Central African Republic, Chile, China, Colombia, Comoros, Congo (Brazzaville), Congo (Kinshasa), Costa Rica, Cote d'Ivoire, Croatia, Cuba, Cyprus, Czech Republic, Denmark, Djibouti, Dominica,Dominican Republic, East Timor, Ecuador, Egypt, El Salvador, Equatorial. Guinea, Eritrea, Estonia, Ethiopia, Fiji, Finland, France, Gabon, Gambia, The, Georgia, Germany, Ghana, Greece, Grenada, Guatemala, Guinea, Guinea-Bissau,Guyana, Haiti, Holy See, Honduras,Hong Kong, Hungary, Iceland, India, Indonesia, Iran, Iraq, Ireland, Israel, Italy,Jamaica, Japan,Jordan, Kazakhstan, Kenya,Kiribati, Kuwait, Kyrgyzstan, Laos, Latvia, Lebanon, Lesotho, Liberia, Libya, Liechtenstein, Lithuania, Luxembourg, Macau, Macedonia, Madagascar, Malawi, Malaysia, Maldives, Mali, Malta, Marshall Islands, Mauritania. Mauritius,Mexico, Micronesia, Moldova, Monaco, Mongolia, Morocco, Mozambique, Namibia, Nauru, Nepal,Netherlands, Netherlands Antilles, New Zealand, Nicaragua, Niger, Nigeria,North Korea, Norway, Oman, Pakistan,Palau, Panama, Papua New Guinea, Paraguay, Peru, Philippines, Poland, Portugal, Qatar, Romania, Russia, Rwanda,Saint Kitts and Nevis, Saint Lucia, Saint Vincent and the Grenadines, Samoa, San Marino (10/04, Sao Tome and Principe, Saudi Arabia, Senegal, Serbia and Montenegro, Seychelles, Sierra Leone. Singapore, Slovakia, Slovenia, Solomon Islands, Somalia, South Africa, South Korea, Spain,Sri Lanka, Sudan, Suriname, Swaziland, Sweden, Switzerland, Syria, Taiwan, Tajikistan, Tanzania, Thailand, Togo, Tonga, trinidad and Tobago, Tunisia, Turkey, Turkmenistan, Tuvalu,Uganda, Ukraine, United Arab Emirates, United Kingdom.Uruguay, Uzbekistan. Vanuatu, Venezuela, Vietnam, Yemen, Zambia, Zimbabwe.